All tools must be used only for the intended purpose, under appropriate conditions and within their use restrictions. The products must not be changed. Their condition is to be checked regularly, but always before use, and damaged or worn parts should be replaced. The thread of the beams and spindles must always be clean and well greased. Be informed about proper usage before starting and in case of doubt contact the manufacturer for advice. Always wear safety goggles and appropriate protective clothing. Pay attention to the correct fit of the pulling tool and permanently monitor the forces occurring during the pulling procedure. 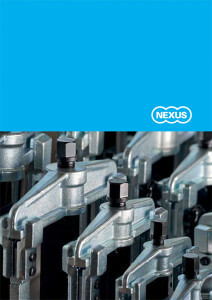 Use the NEXUS safety cover to protect from suddenly detaching parts. The load values specified for the tool must never be exceeded. Check this for mechanical and grease-hydraulic pullers by using a torque wrench and a pressure gauge for oil-hydraulic pullers. The load values are average values which have been determined for new pullers in accordance with applicable safety regulations. Practice-related wear and unfavorable operating conditions can reduce this. To operate the pulling tools using electric or pneumatic power or impact wrench is prohibited, unless this is expressly permitted in the product description. The stated dimensions and weights correspond to the current state of the art and are average values. We reserve the right to make changes to the models and their design, as well as for errors and misprints.